Our May Stock Market Prediction – PART I - Technical Traders Ltd. - Investment Strategies, Analysis & Intelligence for Seasoned Investors. If you follow these arrows from left to right, you'll see how the ADL system predicted an early price breakdown in 2018 – we call this a “Price Anomaly” where price moves against the predicted price targets, then reverts back to near these targets. These can be incredibly profitable trading opportunities for skilled traders as well. That early 2018 breakdown in price was a -318 pt move (-10.95%) and we were alerted to it well before it happened. This is where things start to get interesting for us and our readers/followers. 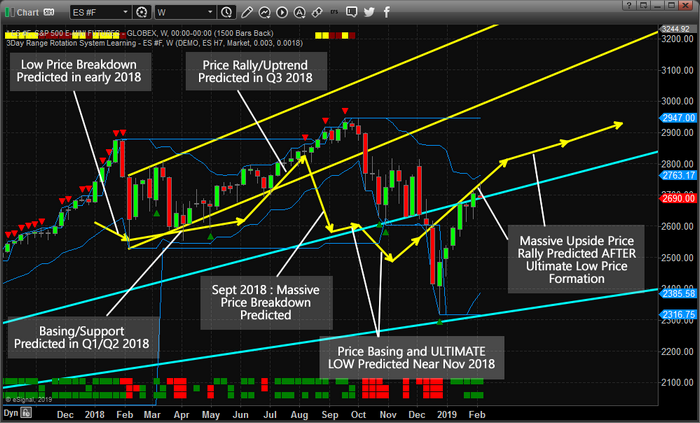 Our analysis on September 17, 2018, suggested that the US stock markets would base and trade sideways before the November 6, 2018, US elections, then break lower to establish an “Ultimate Low” price pattern. What we didn't expect was the size and scope of the “Ultimate Low” price rotation that happened in the markets. Our ADL modeling system suggested a -115 pt (-4.45%) downward price rotation was likely. What really happened was the markets collapsed -453 pts (-16.17%). We believe 2019 will be an incredible year for skilled traders and we believe the markets will set up numerous trade setups for fantastic profits. We are already hard at work developing new member tools, research models and algo trading systems to help our members take advantage of these incredible market moves. Please take a minute to see how our researchers and traders at www.TheTechnicalTraders.com can assist you this year. We will be launching an incredible new member tool in about 30~60 days. You won't want to miss this fantastic new software utility to help you find and execute great trades. See you in the member's section of our site.